This may be my last post for a while. I have returned to Australia after 3 exciting months in Palestine. Some people finish these sorts of blogs with "over all summaries" on the situation in Palestine. I don't want to do that because in some ways the incidents my blog reports speak for themselves and things are still playing out in Palestine. I mean there are obvious things to report about the occupation being horrible and the resistance having major problems in organising (both internal and external) but I don't want to do that here. If anyone in Australia is interested in hearing me speak I am happy to address forums or meetings about my experience. I am based in Canberra but if you can organise an airfare and accommodation for me I am there. I would also be prepared to talk outside of Australia but I figure if you can afford to get someone you should try to get a Palestinian out as their ongoing commitment and struggle continue to inspire people like myself. I encourage people to see Palestine and meet the wonderful and diverse Palestinians for themselves. If you want to get in contact e-mail harrison_g_healy@yahoo.com.au . I will keep this site up and running but I probably wont be adding much for a while. I look forward to still hearing from people though. Hopefully I will return to Palestine. In the mean time check out some of my links and thanks for listening to my rants about the struggles of a people facing an increasingly brutal occupation. I travelled to Beirzeit to meet up with Bassima one of the people in charge of the Institute of Women's Studies at University. When we got there I was surprised to see such a strong political atmosphere on Campus. I had arrived right in the middle of the student elections. Like the elections that I saw in January (see posts "Real Democracy in the Middle East (no it is not Israel)" and "An amazing election day!") for more info. Bierzeit university was covered with flags, banners and leaflets for the various faction. When I was on LaTrobe University in Melbourne a campus with about 16,000 undergraduate students the SRC elections rarely resulted in more then 1,000 votes (6.25%). Yet Beirzeit, a campus with 5,446 undergraduates students able to vote had 4,441 people voting (81.5%). I am guessing the Martyr Yasser Arafat group is a student front for either Fateh or Al-Aqusa Martyr's. If that is the case that would be interesting because when we spoke to Bassima she informed us that the Islamists had won the last two campus elections in a row. Bierzeit University however used to be a major centre for leftist activity in Palestine. When asked about the decline of the left factions in Palestine, Bassima like many others acknowledged the external problems but felt they were an excuse and that the real reason was the left had ceased to organise people at a grass roots level. Whilst groups like Hamas were actually talking to people and taking up the space that should be occupied by the left. She said "Hamas is going into the local communities and talking to women about the importance of the role women can play in their own Islamic sense." On the role of women since the Hamas election, Bassima said "a lot is on hold and remains uncertain." specifically she talked about things that the women's movement was in the process of reform such as raising the marriage age to 18 (from 16) and making it so that women no longer required their husband or fathers permission to get Passports etc. Whilst the new parliament has more women then ever before, the new Hamas government has only one female minister the minister for women's affairs. Bassima told us that the new minister for Women's affairs was from Saudi Arabia and there she studied Sharia Law, so her hopes of progressive change coming from there weren't high. Bassima said she didn't feel that this rise of Islamic forces relates to historical Palestinian culture. Whilst now the majority of Birzeit's women students where the hijab, "back when [Bassima] was an undergraduate at Birzeit, it was rare that you could see a women wearing a headscarf." The institute for women's studies puts out a lot of research on development issues however it didn't appear that political in terms of its outlook and most of the research the texts they provided us from the institute (I am still working through it) appears to be very much aimed at NGO style development research rather then social activism. Unfortunately we only had less then an hour to talk with Bassima so we weren't able to cover everything in as much detail as we would have liked. We talked about the women's movement broadly and Bassima like most other people talked about trying to get women economically independent by providing them with training and trying to get women into university courses (particularly 'non-traditional areas'). This is incredibly important in providing the material basis for women to be independent of their husbands or their family members control. However the issues of social relations seems on the backburner for now. Bassima said that there were different initiatives organised by different women's groups tied to Political factions but unfortunately we didn't have time to go into those. The Women's Institute has several hundred students and has a higher ratio of men involved then many women's and gender studies courses in Australia (a ratio of about 7:3 rather then 10:1). However Bassima sees that as less of a reflection of interest in gender issues or feminism (which like in Australia is often viewed at as a dirty word). 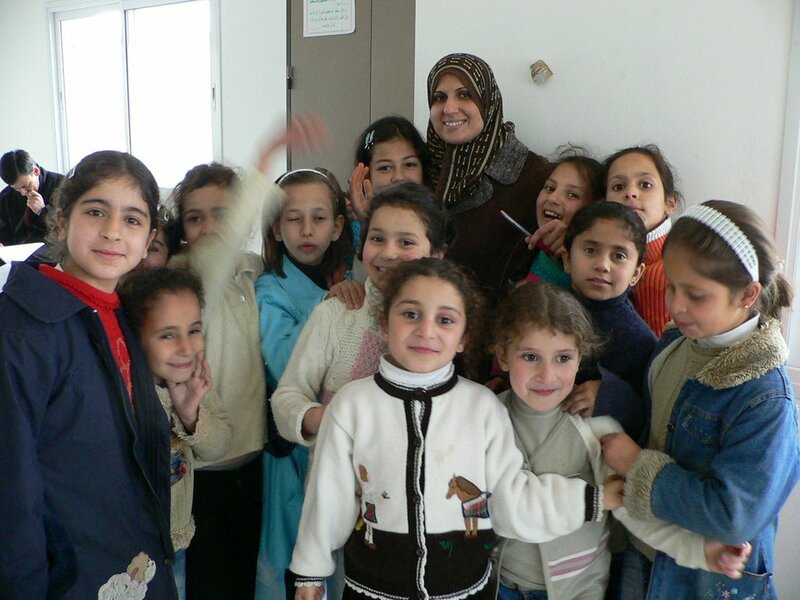 Rather it is a reflection of an interest in working in NGO's (one of the only ways Palestinians can make money) given that Gendering services seems to be popular amongst international NGO's these days. The department for all its progressive ideals cannot really talk about areas central to women's studies departments in Australia such as homosexuality, on this issue Bassima just said that it was taboo and that she has "a friend who had to leave for Brazil, so he could be open about his sexuality". Bassima said it is "important for the women's movement to be an integral part of the anti-occupation struggle and you can't have freedom for women without freedom for Palestine, and you can't have freedom for Palestine without freedom for women." I am writing this blog post in the wake of the Suicide Bomb attack on a Tel Aviv bus station where 5 people were killed. Since I have been in Palestine there have been 2 suicide bombings. The one before this recent attack only took place, a couple of weeks prior and killed 4 settlers in a settlement just outside of Nablus. I do not feel it fair to talk about the suicide bombing in Nablus and the one in Tel Aviv like they are the same. The settlement outside Nablus is a settlement of armed extremist settlers who are waging in many senses of the word a guerilla war, to drive out the Palestinians. They are not civilians and I don't morn their deaths. The bombing in Tel Aviv however is a different story. Whilst Israel may be a coloniser not all Israelis support the occupation and the arbitrary killing of Israeli civilians does nothing to aid the Palestinian cause. While 5 Israeli civilians have lost their lives this year as a result of suicide bombings, nearly every day since I got here, I heard stories of Palestinians killed. I was personally near at least 5 killings of Palestinians since my time here. This is on top of the non-fatal collective punishment that the Palestinians face on a daily basis some of which is recorded in this blog. With the literal torture that Palestinians are facing I am surprised that one of them hadn't taken up this extreme reaction earlier this year. In terms of the hitting of civilians one thing that is not really looked at in terms of Israel's recent bombing of Gaza is that they have launched over 2000 missiles yet have only killed 16 people including children. To be honest I am surprised that 2000 missiles cant kill more then 16 people and suggests to me that these bombs are very erratic in terms of what they hit and of course they are going to hit civilians. The occupation is causing ongoing terror, frustration, control etc and suicide bombing of civilians whilst horrible needs to be understood in that context. I attended probably the weakest demonstration in Beit Sira to date. There were 10 non-Palestinians (Israelis and Internationals) and about 35 Palestinians out of a village of several thousand marched against the wall in the village. 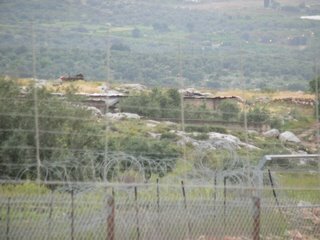 Israel has been rapidly increasing its construction of the apartheid fence in Beit Sira, so much work had been done since I was at the village last. The rally organisers talked about confronting the fence however due to the lack of numbers, we just marched up the road to where the special response unit was. We sat down in front of the military lines for 5 minutes and then walked back. The reason for the small turn out? Israel has been ringing up the Palestinian villagers individually and threatened to take away permits for any Palestinian involved in the actions. The permits hanning over their heads are for such things as allowing to work in Israel or simply permits to allow them to drive Taxi's through Area C (Areas of the West Bank directly controlled by Israel). Of course this is illegal and Israel will never admit publicly that they were making these threats but this is what the villagers were telling us. This only adds to the economic grief of the Palestinians who are being starved of funds since Hamas were democratically elected. Still with the situation getting so bad for Beit Sira the people have two options to capitulate or fight. Sadly at this stage it appears the majority are submitting. One of the very frustrating things about Palestine is a distinct lack of cross village solidarity. Despite the close proximity of villages to each other (5 minutes away) the only activists that travel to support the different demonstrations are the Israeli activists, the Internationals and the ISM Palestinian Organisers. Damn tourists, but only when they are with the Palestinians. Passover, a time of family meals, of bad public transport in Israel and a time when thousands of Jews converge on Hebron. One of the soldiers informed us an estimated 10,000 people were coming to visit the extremist settlers in Hebron. ISM and Tel Rumeida activists as usual patrolled the streets to help provide a sense of security for the Palestinian population and to assist them during the frequent events of settler violence. Four Israeli activists came to help out as well but were stopped by the police who decided they weren't allowed to be in Hebron because they were Israelis but weren't with the settlers. They got escorted out of Hebron in a military jeep. There were so many tourists walking all around H2 but it appeared that most of them were totally oblivious to the problems occurring in Hebron. There were some Israelis amongst the blowins but a lot were Jews from places like the United States. When I first got to Hebron I took pictures of Shuhada street, where the Palestinian shops were all closed (because the army thought they might 'provoke' the settlers. For me it was important to take pictures of what was clearly a once thriving street to reflect on the impact of the occupation. For the tourists it felt like they were taking photo's of just another interesting street. I am so used to Settlers running around and beating up Palestinians it threw me back a bit having Americans walking up the hill complaining in a joking manner about having to walk so far. It felt more like Seinfeld then settlers. I have the feeling that so many of the tourists there were just observing the wacko extremists in the same way that many less religious Christians may visit orthodox churches for 'the experience.' In some ways their presence actually made things safer because I don't think the settlers wanted to alienate their friends by having them witness the stoning of a 5 year old. After most the tourists had left the streets, a group of us internationals on tourist visa's went out to get food. The savory food in Hebron is the best in the West Bank (that I have experienced so far) and I recommend people eat out in Hebron. 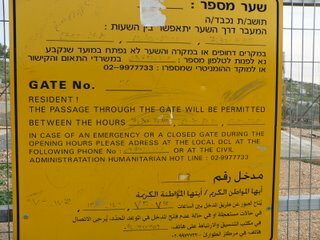 We walked through the checkpoint to H1 as normal but some of the internationals at the back of the group were told that H2 was now a closed military zone for 'tourists' and that none of us would be let back in till Passover was over in 3 days time. We tried to dispute our being kicked out of H2 pointing basic things out like the fact that we have an apartment in H2 and that they were kicking us out on the street. We also asked why the closed military zone order was only being enforced on our 'tourists' but the 'tourists' who were staying with the settlers were not being hassled. Many of the settlers aren't even Israeli coming from several other countries and never even going through the process of obtaining citizenship. So faced with this 'closed military zone' that only applied to about 8 people, we decided to sneak into H2 through a back way. We hoped given the arbitrary and stupid nature of the closed military zone order that maybe when we got up the next day things would be sorted. Some of the others volunteered to do the morning school run whilst some of us volunteered to sleep in (slacker I know). At about 7am the activists came into the apartment agitated telling us that their passports had been confiscated by the army who told them they had 10 minutes to collect their stuff before they had to leave H2. We quickly got dressed in case the army was going to raid the apartment and those who had their passports confiscated decided to go down, collect their passports and leave. The whole military order thing seemed dodgy to me. So I decided to go onto the street, knowing that they were likely to insist I leave. I was to refuse to leave and be arrested. The army would have to have me face a court within 24 hours and the judge could rule (hopefully in my favor). Rather then calling the police to arrest me (soldiers can arrest Palestinians but only detain Internationals or Israelis), six soldiers decided it was just easier to try and strangle me, beat me and throw me out through the checkpoint. I wasn't too badly beaten but a bit shaken. One of the other internationals in the apartment who actually wanted to leave H2 and was to bring down my bags was stopped and told she couldn't leave H2. She asked why that was and the soldier basically said the rules had changed from 20 minutes prior because he said so. She argued with him for a while before he finally agreed to let her go if she was 'escorted' inside a military jeep all the way to the checkpoint. Apart from trying unsuccessfully to get into occupied homes, we also attended a demonstration in the village of Salem near Nablus. The hills of the Nablus region are covered with tiny extremist settler populations. Salem has been facing constant harassment from settlers. The settlers have cut large numbers of the villages olive trees and 68 year old man being beaten and taken to hospital 3 days prior. Rabbi's for Human Rights decided to organise a demonstration in Salem to allow for the Palestinians to be able to work their land. The rally had a very different dynamic to those occurring in the South. There were only 10 Palestinians there, the rest were Israelis and whilst I recognised some of the Israeli anarchists the bulk of the 40 Israelis present at the demonstration were part of the kibbutzim movement (little Jewish in theory "collective" farms). The demonstration walked to the lands that the Palestinians wanted to farm (olive groves and grazing lands for sheep). When we arrived the Palestinians and some of the Israelis began to work. However the whole rally quickly gravitated around two settlers who blocked the Palestinian tractors. The settlers and the kibitz people started to argue with each other in Hebrew. One of my anarchist friends told me that the discussion was really bad and that we should just continue plowing the field. I asked him what he meant by that and he said the entire argument was basically a chest beating session as to who was more patriotic and Zionist. Whilst the settlers went on with their usual rhetoric about how all this land was theirs, the kibbutzim people argued along the lines that by expanding into the west bank the settlers were undermining the Zionist project. They talked about the taking over of the majority of Palestinian land like it was a good thing. They even put forward the racist myth that "they made the desert bloom." This line about making the desert bloom is basically a myth that apart from Jewish Zionist colonisation, the Palestinians were all backward and essentially ate sand. They try to block out the history of the majority of Palestinian villagers that weren't just taken over in 1948 but were actually destroyed and entirely replaced by Jewish towns. The Palestinians have very deep roots with their land and places like Jayyous both what we could access and the vast lands over the horizon make it clear that such talk is entirely nonsense. 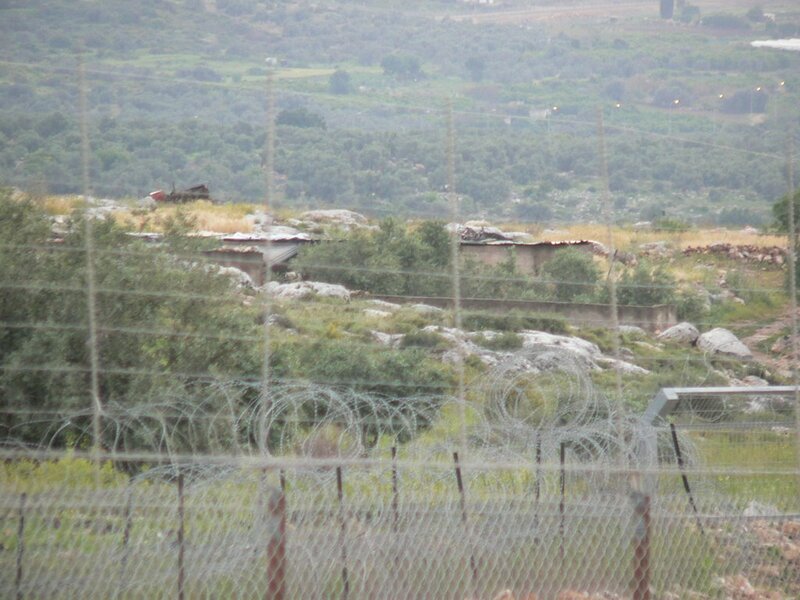 Anyway the argument got louder and louder, eventually 6 army vehicles drove up to protect the settlers. 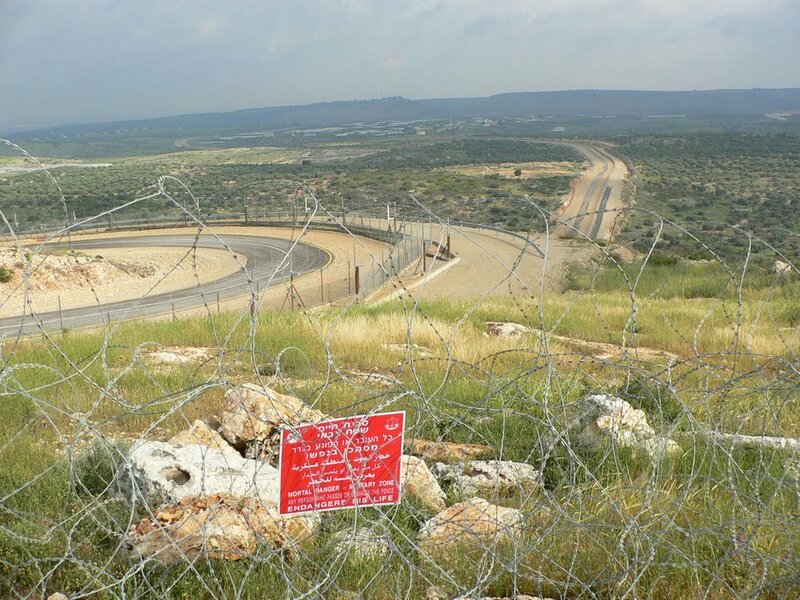 The army denied the Palestinians the ability to work on much of their lands and supported the settlers who ended up driving their ute around the sheep, that were slightly further back, in order to scare them. Apparently the sheep were provoking or something. I joked with a friend that they were Palestinian sheep so they probably thought there was a bomb in them or something. The rally surrounded the ute and I managed to stuff flowers and grass in one of the petrol canisters of the settlers. The army finally instructed the settlers to go further back but forbid the Palestinians to move forward onto their land. We stayed for a few hours but had to go back to Nablus to deal with some home occupations. The settlers around Nablus are extremists who constantly harass Palestinians and who would be fairly described as crazy by most Israelis. A few weeks ago there was a suicide bombing which killed 3 settlers in the Nablus hills. Normally I do not condone suicide bombings as they kill innocent people and set back the Palestinian cause. Apart from my sympathy towards the poor man who felt the need to kill himself I have no sympathy for these people. The settlements around Nablus are military instillation for an armed guerilla army that unlike the proper Israeli army have no rules or regulations at all. A planned breakfast and a cake making session in Jayyous were cancelled as we received word that Nablus had been invaded by the Israeli military. Within two hours another ISMer and I were in Nablus. We were quickly directed to where a conflict was taking place between an armored jeep firing plastic coated metal bullets and Palestinians throwing stones. We stayed next to the medical team as the last stones were thrown and the army retreated out of the city at least in terms of street presence (elaborate later). Several people had been arrested. No one was "killed" but several were injured a boy was shot with a rubber bullet right in the middle of his forehead forcing part of his brain out of his scull. He was in a severe condition possibly brain dead. 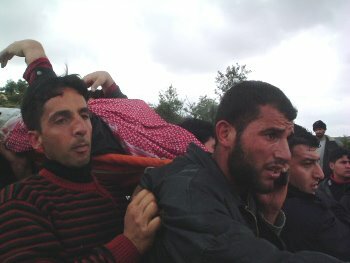 Palestinians don't have the medical equipment for brain surgery, he would have to be moved to either Israel or Jordan. The army had left the street but there were still houses occupied by the military. The Israeli army during missions often occupies house and holds the families inside hostage to prevent the Palestinians from retaliating. 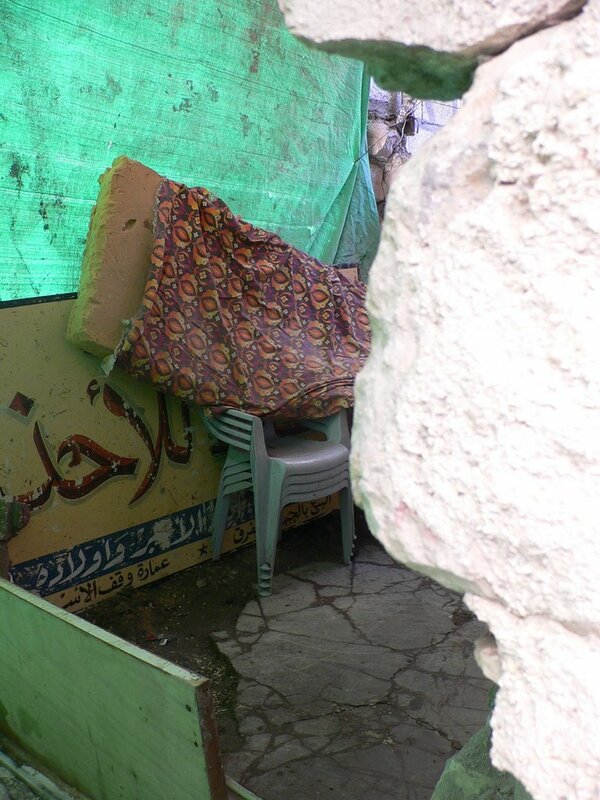 The army is regularly coming into Nablus at night, arresting people, and occupying houses. Just a few days before we arrived in Nablus two women were taken out of their house naked and were beaten by soldiers before being arrested. All this is happening at night, when there is nothing we can do for fear of getting in between the soldiers and Palestinian fighters. We stayed for a few days in Nablus, every night there was heavy gunfire and sometimes explosions. The next morning the Mosque PA would announce what had happened that night and our co-ordinator Mohammed would translate. Mohammed took us on a tour of the old city. So many buildings had new doors or walls as a result of the regular attacks on Nablus. Some of the destruction was old but there were some signs from the previous night where the army blew a hole in the wall of a house. Some of the houses had been re-built so many times the family has stopped rebuilding them and have just abandened them as monuments of the occupation. We did the best we could to try and get into the occupied houses with the medical teams but were refused. We would ring non-stop on the doorbell and ask to speak to the captain but they wouldn't even answer. One of the teams that relieved us at one of the occupied houses said the soldiers were so board that even though they were not meant to speak to the people outside they ended up mocking them and doing silly mimicking of "Captain we are an international medical team please talk to us." There were 15 people including kids in that house and we finally left food on the doorstep that was collected. The families were released after a few days. The only reason this family were taken hostage is because their house has a good snipping window. The view of the hills in Nablus are lovely, in Sydney you pay for an apartment based on how good the view is. Here in Nablus it really doesn't strike me as a sales point. We think the increase in night attacks and home occupations is a sign of things to come, possibly a re-nvasion similar to the one I experienced in February. 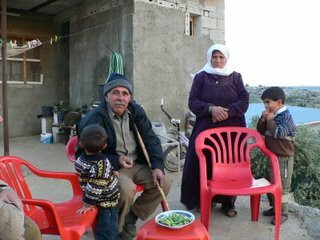 I spent two days in a village called Jayyous that's had its land confiscated by the wall. The village owns 13,000 dunum's of land (aprox 3,212 acres), but only 2,000 dunum's (aprox 494, acres) of land lies on the Eastern side of the wall. This leaves the Palestinians with barely any land for the expansion of their 3,000 strong village let alone farming land. The people of Jayyous are very dependent on farming for their survival. Even the school principle subsidies his wages with money he earns from his green houses of tomatoes. The land confiscations along with the refusal to allow the majority of Palestinian's work permits inside Israel since 2002 has crippled Jayyous' economy. Jayyous is close to the green line and used to have a large number of people work in Israel. Now the Palestinians are facing further economic hardships as the Palestinian Authority (the provider of income to 1/4 of Palestinians according to the UN) has stopped paying its workers in the wake of Europe, Israel etc cutting aid because of the Hamas victory. Jayyous residents can only access their land through 2 gates. 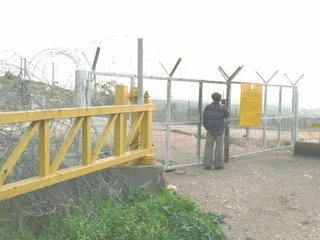 These gates are open "in theory" 3 times a day and only for 15 minutes making working hours incredibly inflexible for Palestinian farmers. The gates are only open at 7.30-7.45am, 1.45pm-2pm and 5pm-5:15. There is a family who lives on the other side of the wall cut off from the rest of the village. Originally the army would harass this family to leave their home, however the family of 7 has refused to leave, instead cut off from the village the kids are often late to school or have to wait for long periods of time to get home. During our time in Jayyous we met a farmers who had his lands cut off by the wall. His family had lost the bulk of their lands. About 75 mature olive trees were cut down just on the path of the wall itself. A friend in ISM who is a tree surgeon told me that 75 trees would be about $700 US profit for the farmer if sold for olive production. There were many more trees on the other side of the wall but they were difficult to access. Even though the trees were only 30 meter's in front of us the family would have to walk several kilometers around to the gate and then back to his land in order to access it. Many of the other villagers are in a similar situation. He pointed to a shack across the wall that his father used to camp in so he could stay over night rather then have to travel each day. The army came in and threatened to shoot him if he stayed over night. The 11 members of his family stay in a tiny house near the wall. He once lived in a reasonably sized house in the middle of the village but doesn't want to move back there for fear of having more land taken. The permits to cross the wall aren't a guaranteed thing though. If a Palestinian is arrested or seen to be 'causing trouble' he could be denied a permit to cross the wall. I met a man who was jailed for 5 years and exiled to Jordan for 10 for his work in Fateh. I asked if he meant Al-Aqusa and he said no Fateh and that his work was political not military in nature. The man was elderly and was no longer involved in political activity either. 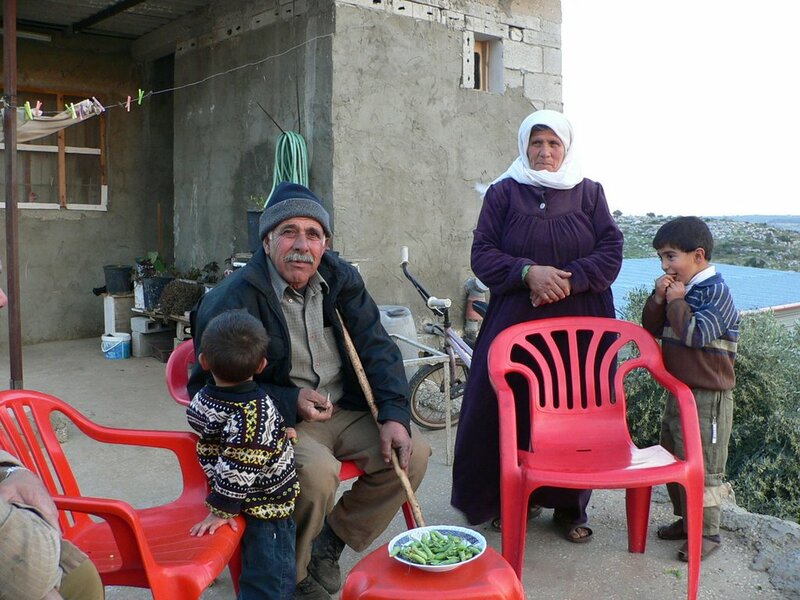 He was denied access to his land so only his family can cross but not him. He has been unable to visit his land for years. The villages utilities have also been affected by the occupation. The village has 7 wells, all on the other side of the wall. Unable to gain access to their water Jayyous has had to pay to have water pumped in from another village. In terms of electricity the village has been relying on two generators to provide their power. for several hours in the afternoon there was no electricity. The village is currently in the process of hooking themselves up to the Israeli power grid. However the village isn't holding their breath as another nearby village waited 2 years after the wiring had been done for Israel to switch them into the system. Everyone is desperate for money. Up until now there has been a Charity school running English programs in the afternoon for the kids. At the time I was there it looked like the school was going to close down in less then a month because they could not raise the $250 US dollars a month required to sustain the program's 2 teachers (who are only paid US $100 each) and rent etc. A US based charity now might be taking over where the previous donors left off but it is impossible to say how long that funding may last. I attended a legal training workshop run by a group of progressive Israeli lawyers, for International and Palestinian activists. Having been involved in the civil liberties campaign in Australia it was frightening just how few rights Palestinians have. Even before being arrested a soldier or police person can hold a someone for three hours without charge. Once arrested an international has 24 hours before they have to be presented before a judge (slightly longer if they are detained after 2pm on Friday, because of Shabbat). A Palestinian on the other hand could spend 8 days before being required to front up to the military court. You have the right to notify your lawyer but you do not have the right to speak a lawyer until right before your hearing. Palestinians can be denied a lawyer for up to 21 days despite being placed in front of a judge after 8 days meaning that they aren't allowed to have their lawyer present at their hearing (maybe the lawyer will be allowed into the court after their client has left). Defense lawyers and even the defendants can be denied information simply on the basis that it is a security risk. In which case it is more of an interrogation then a real trial. Sometimes neither a lawyer or family will be notified of the Palestinians detention for up to 8 days depending on the investigating officers discretion (to which there is no criteria). While Israelis deal with a civil court, Israelis are required to face a military court where the judge as well as the prosecution are both military. A Palestinian doesn't even need to be found guilty of a crime in order to be incarcerated and can be put under 'administrative detention' without charge for 6 months at a time. This 'administrative detention' can be consistently renewed and some Palestinians have spent up to 7 years in jail without charge. There are currently hundreds of Palestinians who are under administrative detention. Another problem that many Palestinians have is the use of collaborators to obtain a confession. Even though Palestinians have the right to silence they are constantly treated like they don't and often after refusing to say anything they will be released into a holding cell where they will tell everything to another Palestinian in the cell with them. Sometimes the collaborator will pretend to be an agent of Fateh or Hamas and try to get their comrades to reveal things to them. One of the most shocking things I had heard that day though was that a Palestinian 10 year old can be charged as a minor. The Israeli settler kids who've throw stones at Palestinians and internationals like myself, can't be charged until they are 14. There was heavy rain in Palestine last Saturday. The valley in between the villages of Bil'in and Safa was flooded and I went there with reports of one Palestinian dead and another missing. Soon after arriving I was informed that the one that was supposedly dead was actually just in hospital and the other was still missing. In the valley I talked to locals who said that the car had been stopped on the bridge due to rain water rising above bridge level. The 4 passengers in the car got out to push and two were swept up in the current. The rain levels were high but they were unusually high as hundreds of meters away the recently constructed section of the apartheid wall acted as a dam preventing the water from being dispersed. It also looked like erosion caused by construction would have also prevented water from being absorbed into the soil. I climbed across the side of the valley with Palestinians who were searching for Eyad Tahar the missing Palestinian. While I was walking back and forward across the valley, Palestinians discovered the body caught on razor wire under water. Not only did the damning effect of the wall contribute to Tahar's being swept away but he probably drowned because he couldn't resurface because his body was caught on the wire. There was no sign of major cuts or bruises indicating that he made it to the razor wire without getting injured meaning that he probably could have survived had he been able to resurface. When I was finally confronted with the body the Palestinians had covered it with a shroud but his hands were pointing upwards as thought they had been locked into that position when the oxygen left his body. It was the first time I has seen a dead body but it was clear from the reactions of Palestinians around me that they were so used to seeing deaths like this as an everyday occurrence. An activist just returned from Palestine. Interesting in talking about my experience to anyone happy to listen.